People have emailed me about this little buffalo checked rug several times. 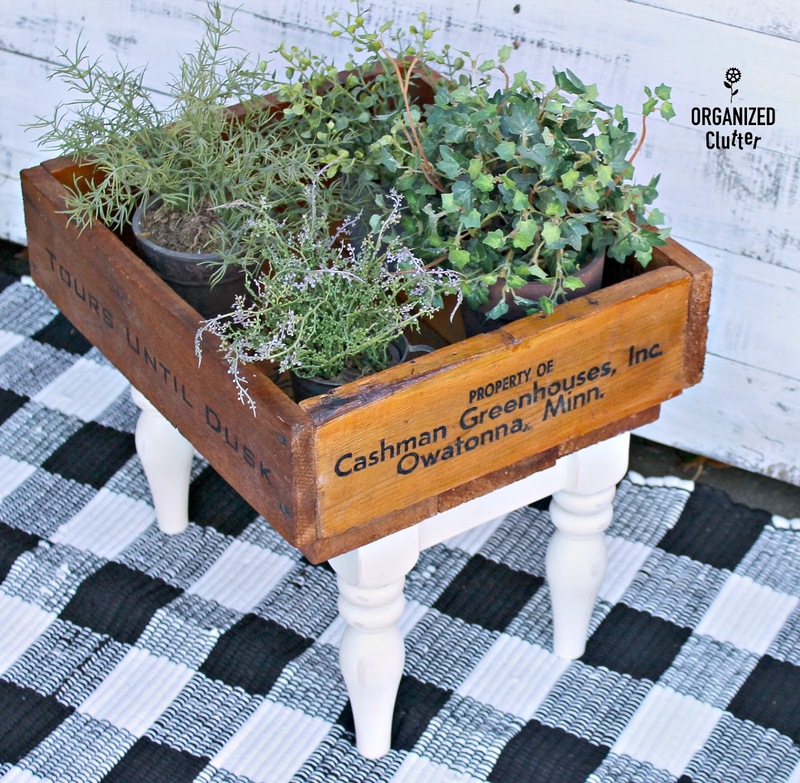 I use it for staging my projects all the time as a rug AND as a table runner. Where did I get it? It was a "Fall Shop" item at Hobby Lobby last fall. I purchased it at a Hobby Lobby store for 40% off. 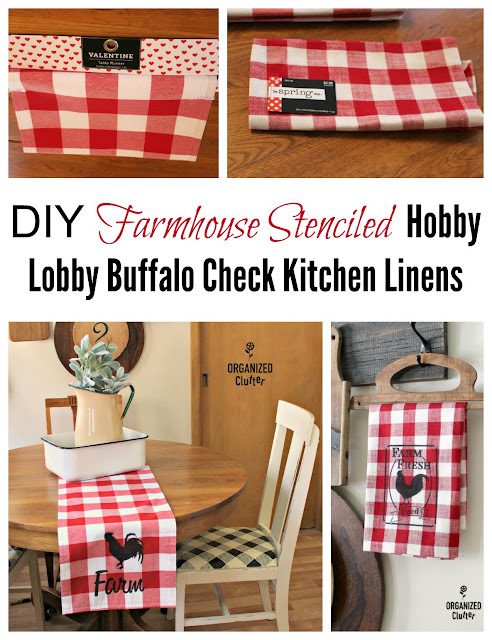 Earlier this week, I found this red and white buffalo checked table runner at the Bemidji Hobby Lobby store. It was in their Valentine's Day decor. Although it's red, there really isn't anything else that screams Valentine's Day about it! It can be used all year round. Check out Hobby Lobby's seasonal decor for a deal! It was regularly priced at $9.99, but it was a sale item at 40% off. 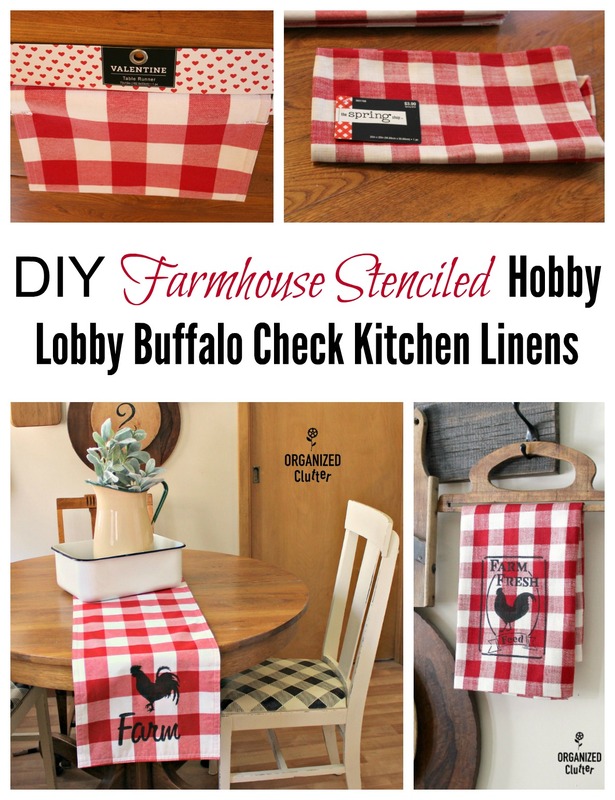 I found this red and white buffalo checked napkin at Hobby Lobby in the "Spring Shop". It was 40% off as well. Because the table runner was 72" long, and too long for my round eat in kitchen table, I cut about 9 1/2" from one end of the runner. Because I don't sew, I used a strip of HeatnBond UltraHold Iron-On Adhesive to fuse a new hem using my iron. You could also use an iron on hem tape. This is my new fused hem edge. Not pretty, but it's on the back. I would wash the runner in a lingerie bag in the washer, and should the hem pull loose, you can add additional iron on adhesive. The above stencil is my *Old Sign Stencils Farmers' Market stencil. I am only going to use the word "farm" so I have a piece of blue painter's tape to end and edge off the the rest of the stencil. Since I have had such good luck using Fusion Mineral Paint on fabric stenciling, I will be using Fusion Mineral Paint in Coal Black . 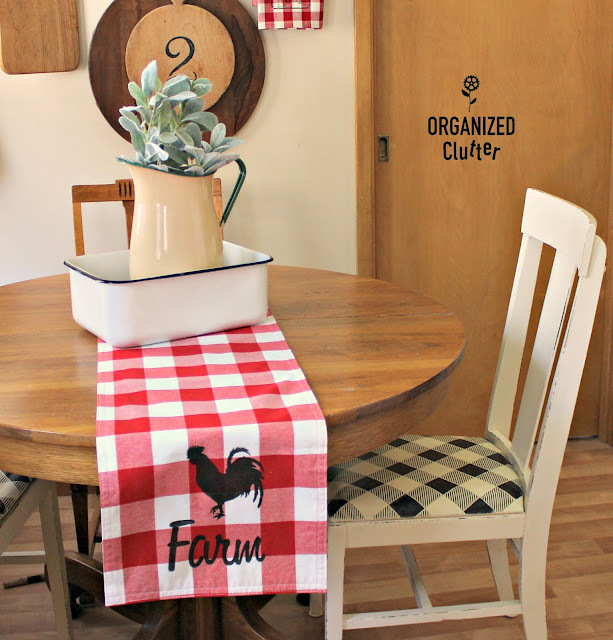 Above "farm" I stenciled a rooster from a Hobby Lobby animal stencil. 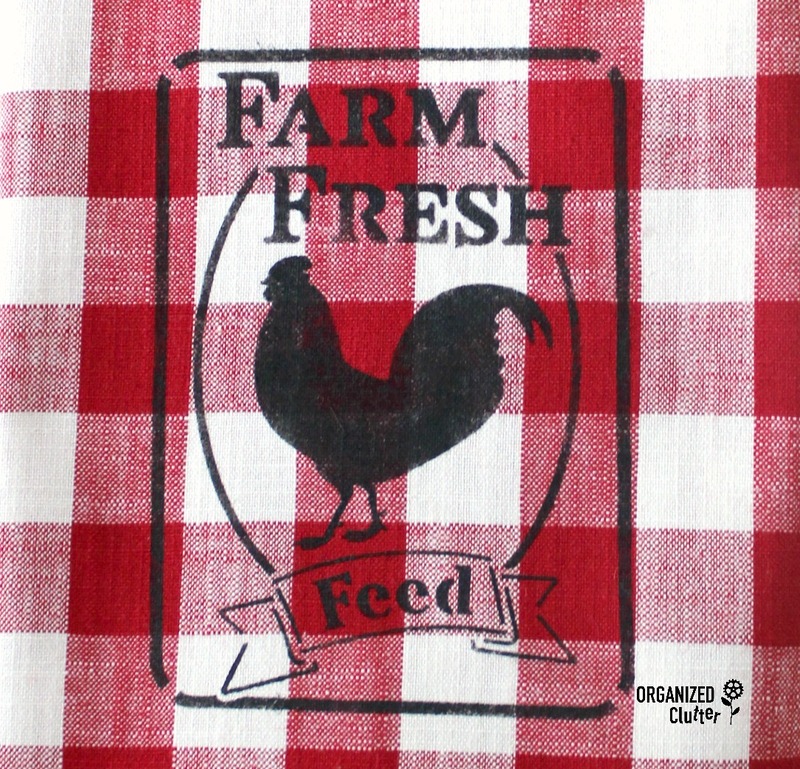 I centered the rooster part of this feed sack stencil from Hobby Lobby on the napkin. I used Fusion Mineral Paint in Coal Black for this stencil as well. Here is how my table runner turned out! I purchased both of these linens for $8.39. Just add a stencil to add some fun! 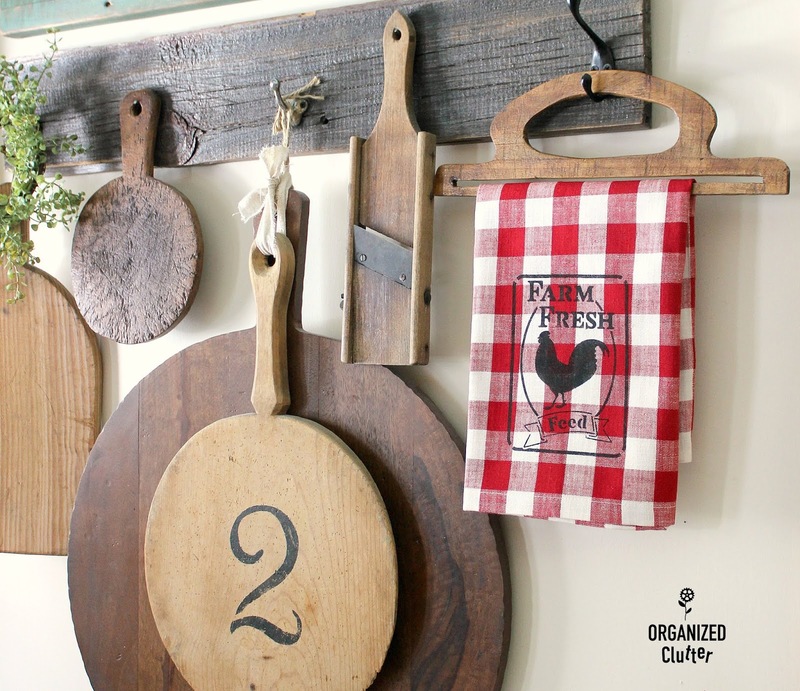 The feed sack stenciled napkin is hanging on a wooden re-purposed purse handle. 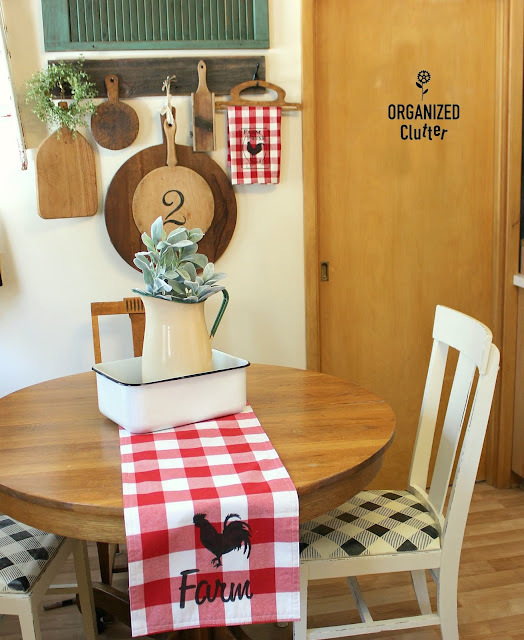 An easy farmhouse decor idea! ADORABLE !! LOVE !!!!! Great job !